A video broadcasted on ABC News has gone viral. It depicts a driver in Florida losing control of his vehicle, swerving onto a sidewalk and hitting a tree before his car flips onto its roof. The video was captured by a police cruiser’s dash-cam. The police officer just happened to be following Michael James Woody’s vehicle when the accident occurred. Woody, who was uninjured, told the officer that he was texting behind the wheel. Fortunately, the accident happened at night when the sidewalks were not in regular use, but the video comes at a time when Floridians are debating whether or not the recent texting-and-driving ban, implemented last year, has been effective in curbing the number of car accidents related to texting. 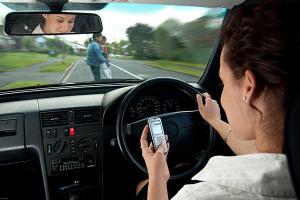 There is no doubt that Florida needs such a law as the state and the country as a whole struggle to combat the texting epidemic that causes about 20 percent of car accidents nationwide, according to the National Highway Traffic Safety Administration. However, critics of the ban say that police officers have not been given enough power to stop texting and driving. The Sun Sentinel reports that only 393 tickets were issued in the three months after the ban went into effect. The low numbers are likely due to the fact that texting while driving is only a secondary offense, meaning that drivers cannot be pulled over for texting and can only be issued a ticket after they’ve been stopped for a different driving infraction. If you have been injured by a driver who was texting, you still have the ability to find justice through a civil suit. At Wolfson Law Firm, we are passionate about keeping Florida’s roadways safe for pedestrians and motorists alike, which is why we have been representing victims of accident injury in Miami for more than five decades. To discuss you accident with an attorney from our offices, Call Us At 305-285-1115 Today! Lawmakers point to the fact that it is a new law and say that it is a step in the right direction. The seatbelt law started out as a secondary offense but was changed in 2009. After it became a primary offense, the number of tickets went up dramatically. Hopefully, that is where the texting ban is headed. For now, a first offense for texting while driving will only cost $30, and a second ticket will move up to $60. State representative Richard Stark says that the next step is to increase the severity of texting tickets in school zones. In the meantime, if you or your child have been injured by a negligent driver, we can help you fight for the compensation that you deserve in the court room. To get started, we offer a free case evaluation for new clients. To schedule yours, Call Us At 305-285-1115 Today!